Prime Minister Nguyen Xuan Phuc meets with President of the Council of State and Council of Ministers of Cuba Miguel Mario Diaz Canel Bermudez. 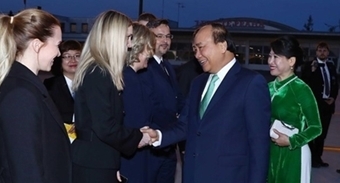 At the meeting, PM Phuc welcomed the first visit of Miguel Mario Diaz Canel Bermudes as President of the Council of State and Council of Ministers of Cuba and believed that the visit would help consolidate the special traditional relations between Vietnam and Cuba. In reply, Miguel Mario Diaz Canel Bermudez said his greatly values the time-honoured friendship with Vietnam and affirmed the resolve to reinforce bilateral ties. Both sides consented to facilitate businesses’ partnerships and investment in new areas such as telecom, pharmaceuticals, banking, and biotechnology. The pair agreed upon a host of measures to step up bilateral cooperation with a focus on continuing to tap existing cooperative mechanisms and intensify exchange visits, effectively implementing the new trade agreement, and seeking efficient solutions for broader cooperation with respect to the two countries’ specific economic characteristics and management mechanisms. They were also unanimous in their joint efforts to successfully organize the 36th meeting of the intergovernmental committee later this year, and strengthen exchange visits at all levels and the sharing of experience in socio-economic development. NA Chairwoman Nguyen Thi Kim Ngan welcomes President of the Council of State and Council of Ministers of Cuba Miguel Mario Diaz Canel Bermudez (L). She voiced her confidence that the new leadership will continue effectively implementing the policy adopted by the Communist Party of Cuba (seventh tenure) in July 2016, including successfully building the new Constitution. The Vietnamese legislature and people always support the revolutionary cause of fraternal Cuban people, she noted. Bermudez, for his part, said his country treasures traditional bilateral friendship, founded by Presidents Fidel and Ho Chi Minh, and generations of leaders and peoples of the two countries while hoping that the two legislative bodies will share experience and work closely at international parliamentary forums.